We had some friends over during the weekend and I made fruit and vegetable kebabs for the kids. I made some extras, as usual, and decided to include them with this 'Cat on a Fence the Night of the Full Moon' bento. 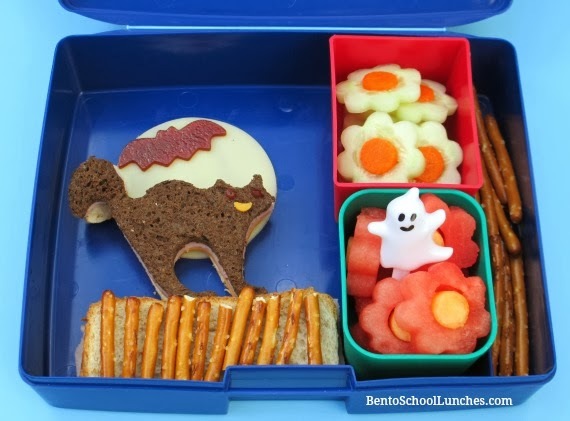 Below is another snack bento I made for Nikolai as we have a busy day today and I will need something ready-to-eat for after school. Cat shaped pumpernickel sandwich on fence sandwich with pretzel sticks. Behind cat is full moon of provolone cheese and fruit leather bat. Fruit leather also used for cat's eyes and a mild cheddar cheese grin. Cucumber cut to flower shapes with carrot centers. Ghost cupcake pick above watermelon cut to flower shapes with cantaloupe centers. Some pretzel sticks on the far right section and this lunch is packed in his Laptop Lunches. Sandwich made with flax bread with Pumpernickel and mild cheddar bat and provolone ghosts (their 'eyes' are transplanted from the bat). Cantaloupe pieces and crinkle-cut carrots with skeleton cupcake ring. Packed in his Happy Home bento box from Happy Tiffin . Fun and creative snack and lunch, I love the black cat! 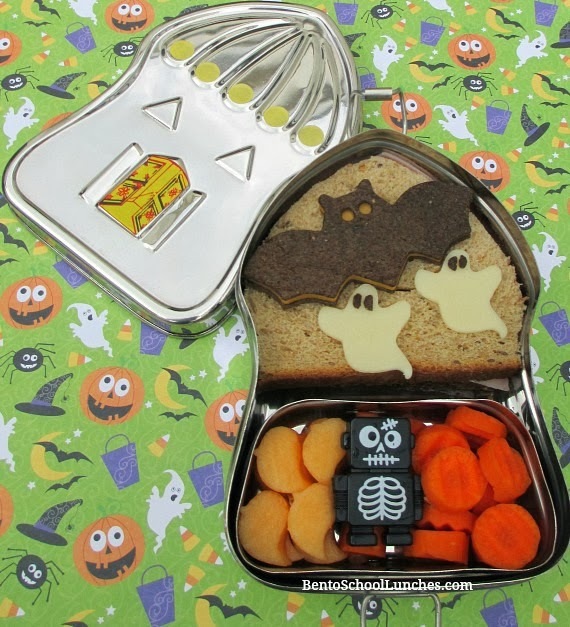 Love the bat and ghosts, and the snackbox is so cute! These are both amazing!!! Wow!